Who Does Everyone Think the Jets Will Draft Tomorrow? Jose was a bit upset. The first seven innings of last night's 6–3 Mets victory over the Nationals were a bit dull, even by Mets-Nationals battling-to-stay-out-of-last-in-the-NL-East standards. The last two were less so. Except ... he was called out. Seriously, watch this play. We tend to take it easy on referees and umpires, but that is as inexplicable a call as you will see. Obviously, the call was made because umpire Marvin Hudson thought Reyes's hand came off the base, but it definitely did not. It wasn't even close. That is a murderous call, a game changer in the eighth inning of a one-run game. It is the type of call that happens to teams that can't catch a break. It is no wonder Reyes went apoplectic. Considering the call, he was almost restrained. Aw, the Mets, those doomed Mets. Then Daniel Murphy, pinch-hitting for Justin Turner, hit a home run to tie the game. The Mets! The red-hot Mets! Then in the bottom of the eighth, Murphy — who would be so much more fun if he never played the field — forgot to cover second base, and a passed ball and a sac fly later, the Nationals had the lead again. Then the Mets came right back and scored three runs in the top of the ninth — thanks in large part to an Ike Davis bloop double; Davis is absolutely out of control the last week or so — and then they had their sixth straight win. It was like the end of one of these great NBA playoff games going on. 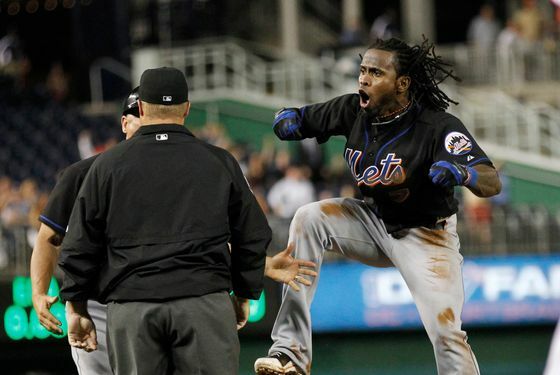 So yes: The Mets have won six in a row. The first game of those six happened to be when Jason Bay returned to the lineup. (It's that Canadian magic.) The Mets are out of last place and only two games under .500. Wins like last night's only count as one, but man, it felt like more. That was fun to see.